Blackinton B701 Canadian Badge - B701 - 1 15/16" x 2 13/16"
Home > Blackinton > Police Badges > Canadian Badges > B701 Canadian Badge - B701 - 1 15/16" x 2 13/16"
B701 Canadian Badge - B701 - 1 15/16" x 2 13/16"
Fur trading, specifically of beaver pelts, was an important part of Canada's history. Thus the beaver became its national symbol. 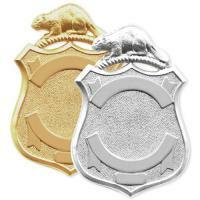 Now you can display your pride with this shield from blackinton featuring a beaver on top. This classic item features two decorative panels for your lettering. An additional panel at the bottom is provided for numbers, rank, etc. The center area allows for a 15/16" seal. The Blackinton Canadian style B701 measures 1 15/16" by 2 13/16" and is crafted in the USA. Please allow up to six weeks for customization delivery. Measures 1 15/16" by 2 13/16"
©2002-2019 CopsPlus.com: Blackinton B701 Canadian Badge - B701 - 1 15/16" x 2 13/16"